Less than 500 mature white-shouldered ibis remain in the wild today, around 400 of these in northern and eastern Cambodia with two small additional populations in southern Lao PDR and on Kalimantan, Indonesia. 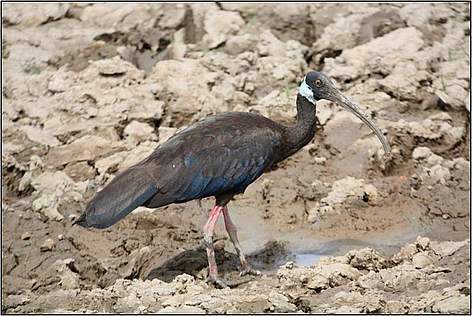 Historically, white-shouldered ibis were distributed patchily but widespread throughout Myanmar, Thailand, Indochina, as well as parts of Malaysia and Indonesia. However, the species has declined dramatically in the 20th century as a result of deforestation, drainage of wetlands, hunting, and disturbance. It has been described as the most threatened large waterbird in South-East Asia. In Cambodia, the species strongholds lie in Siem Pang district, Stung Treng province and along the Mekong River mainstream between Kratie and Stung Treng. Recent estimates led by WCS and WWF show these populations to be of global significance for the survival of this species with estimates of more than 100 individuals for each area. Small numbers of white-shouldered ibis have also been observed regularly at watering holes in the Dry Forests of Mondulkiri’s Eastern Plains Landscape where they probably breed.